HOF President, Jeff Idelson, and Chairman, Jane Forbes Clark, are silent on the NBL heist. With news of yet another public offering of a rare document suspected to have been stolen from the famous August Herrmann Papers archive at the National Baseball Library, officials at the National Baseball Hall of Fame and Museum continue to decline comment on what appears to be the tip of the iceberg on a long-neglected scandal. 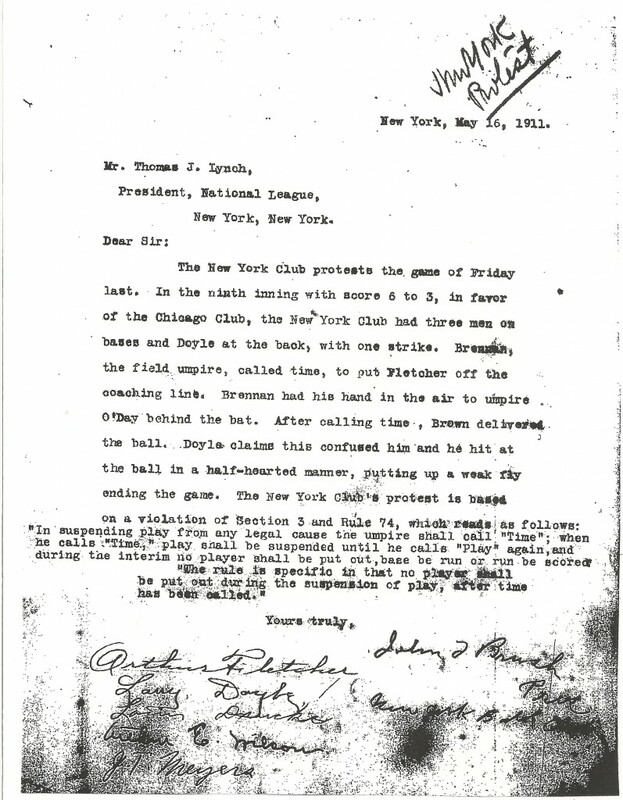 Last week, Heritage Auction Galleries in Dallas, Texas, withdrew a letter written by Pirate owner Barney Dreyfus to National League President John Heydler about a protested game in 1924. The letter appears to have originated from the Hall of Fame’s voluminous files of Major League Baseball’s former ruling body, the National Commission. The Hall maintains a collection of National League protested game files from 1902 to 1926 and over the past few decades numerous letters that appear to have been wrongfully removed from those files, with no mention of their provenance or origin, have been sold at public auction by the nation’s largest sports collectibles companies. The reality, however, is that the evidence supporting the existence of the thefts continues to mount and the Hall of Fame’s failure to recover materials stolen from the game’s shrine in Cooperstown threaten the institution’s credibility. In 2009, Haulsofshame.compresented officials at the Hall with a 300-page report detailing items that appear to have been stolen from the August Herrmann Papers archive and the sales of such items both at public auction and on the black market for baseball artifacts. 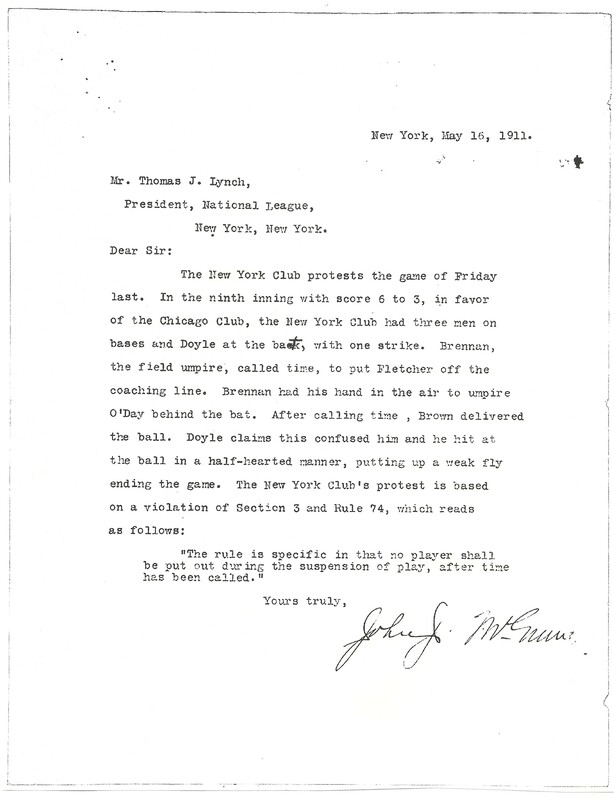 This 1911 Protested Game letter written by HOFer John J. McGraw has sold several times at auction since 1994. The latest sale was at Sports Cards Plus/Sotheby's in 2009. This 1911 protest letter was written by the New York Giants' owner and several of John McGraw's players. It is dated on the same day as the McGraw protest letter sold at SCP/Sotheby's in 2009. 2. Just like the lot recently removed from Heritage’s current sale, this letter is another example written to NL President John Heydler by Hall of Famer Barney Dreyfus. But unlike the auction offering, this Dreyfus letter is still part of the HOFs Herrmann Papers archive. Dreyfus was addressing a protested game played against the Chicago Cubs on Sept. 4, 1908 and his letter is found in Folder 24 of the “Additional Protested Games 1902-26″ section of the HOFs Herrmann archive. 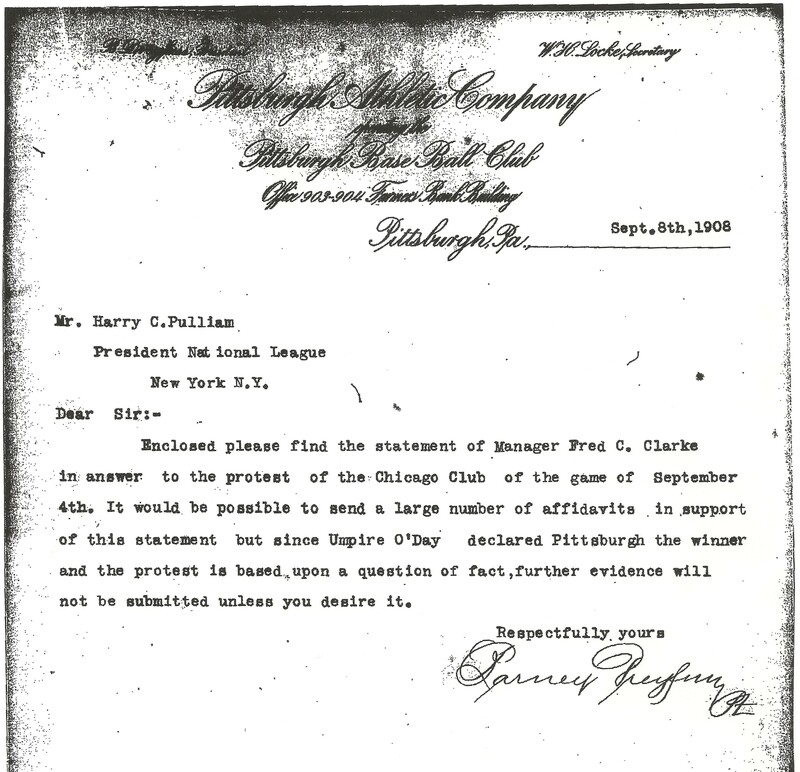 This letter was written by Pirate owner Barney Dreyfus in 1908 regarding a protested game with the Chicago Cubs. The letter still resides in the HOFs Herrmann papers archive. 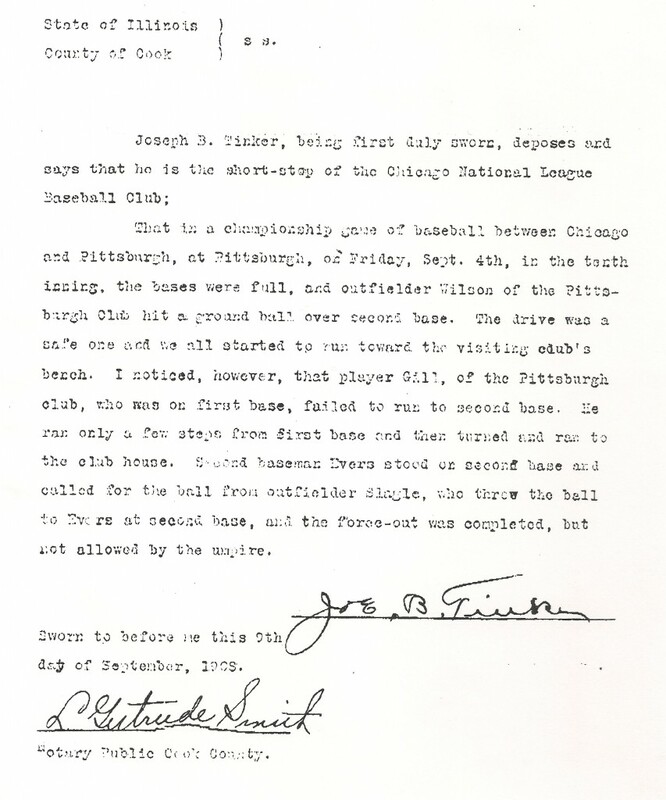 This 1908 affidavit executed by Hall of Famer Joe Tinker was once part of a National Commission file regarding a protested game played on Sept. 4, 1908. The play in question was a precursor to the famous "Merkle Incident" that occured later that same month in 1908. This document was sold by Barry Halper at Sotheby's in 1999. This is not the first theft-related scandal for the Cooperstown shrine. In 1983 The Sporting News uncovered the public sale of assorted World Series programs and other publications loaned by the Hall to Commissioner Bowie Kuhn’s office. At the time, the New York Post ran an article with a headline, “SCANDAL HITS BASEBALL HALL OF FAME,” and the wrong-doing was pegged on J.G. Taylor Spink award winner, Joe Reichler, who at the time worked for Kuhn. James reported that in February, 1983, Hall officials “were able to prevail upon the office of Robert Abrams, Attorney General of the State of New York, to write a letter to the Commissioner’s office.” James revealed that the letter said, “it has come to our attention that certain property belonging to the State of New York may have been converted….” James made the point that being a public institution, the Hall of Fame and Kuhn were in Abrams’ cross-hairs because it was his office’s responsibility to “safeguard” such artifacts in museum collections. TSN broke the HOF document scandal story in 1983 when Ed Stack was HOF President. Unlike the current scandal, the Hall recovered all of the materials that were loaned to Kuhn’s office. In comparison, the estimated total value of all the items sold in 1983 would equal about $10,000. That equals just the low-end estimated value of only the two suspected documents featured in this article. It is believed that hundreds of rare photos and documents were stolen from the National Baseball Library and that the value of those documents far exceeds $1 million. In the past year reports published by Haulsofshame.com have led to the return of several other artifacts stolen from the Hall including cabinet photographs of Hall of Famers Christy Mathewson and “Smilin’” Mickey Welch with estimated values exceeding $10,000 each. A former employee of New York State’s Office of the Attorney General suggested to us that the Hall of Fame’s alleged negligence in safeguarding and recovering artifacts donated to the institution should warrant an investigation by current Attorney General Eric Schneiderman. The Baseball Hall of Fame is a 501(c)(3) non-profit educational museum and does not own the artifacts in its collection. The massive collection of donated materials is owned by the people of New York State and the losses incurred as a result of the 1980s heist as well as the Hall’s actions could end up being investigated by the state’s Attorney General’s office. I’m disappointed that the Hall of Fame can’t think of anything to do about this situation. Until there are legal repercussions – substantial financial penalties as well as jail time – for the thefts of the Hall of Fame’s artifacts, unscrupulous collectors and dealers will continue to operate with relative impunity, their activities unabated by any fear of punishment. Peter Nash and Hauls of Shame do a great service to the baseball community by continually shining a light on the Hall’s inertia and seeming ambivalence about recovering its stolen property, by tracking the stolen items as they comes up for sale through various auction houses and memorabilia websites, and informing us and the public at large when these stolen items appear on the open market. 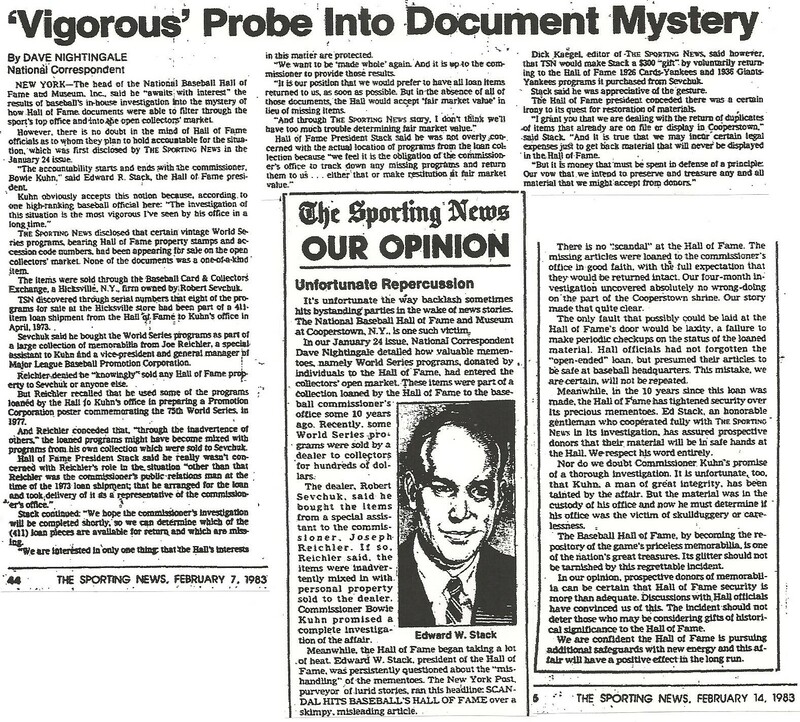 I was also greatly amused to read in the Sporting News account of the Joe Reichler scandal that the New York Post was regarded as a “purveyor of lurid stories” and “skimpy, misleading articles[s].” How little has changed in the intervening twenty-eight years! The saga just goes on and on with the Hall,maybe one of these days someone in the Hall will have the brains, when the light comes on, that maybe we sould do something about all of this stolen stuff, that people have entrusted to us to display and find out where it went.This can be done without any expense to them and at the rate it is going, they might find the whole building gone some morning, wake up,it is past the waiting hour. It occurs to me that anyone outside of the HOF or a public repository (library, museum, etc) who handles these documents without notifying law enforcement is taking part in the theft of these items. It is worth noting that NOT ONE of these business, i.e., the auction houses, authentication firms or collectors would tolerate the theft or public exposure of their private business documents, emails, electronic files, etc. without taking (or threatening) legal action to those who took or diverted those records. That is why I would never dream of leaving anything of mine to the Hall. Too many sticky fingers! Anyone find it scary that everything in the Hall of Fame belongs to the People of New York State? ?